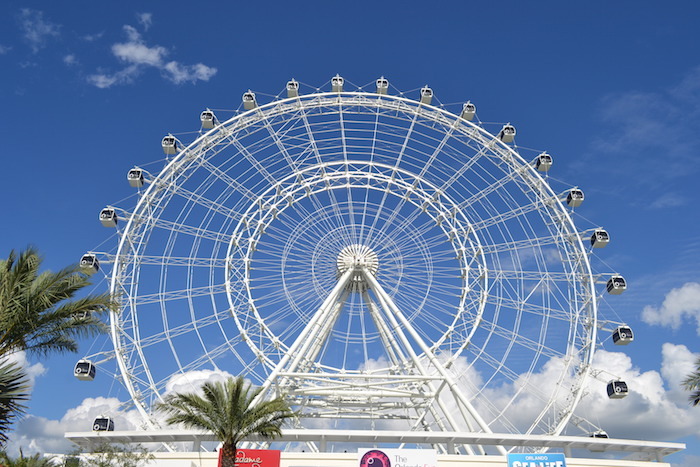 The Orlando Eye is OPEN! 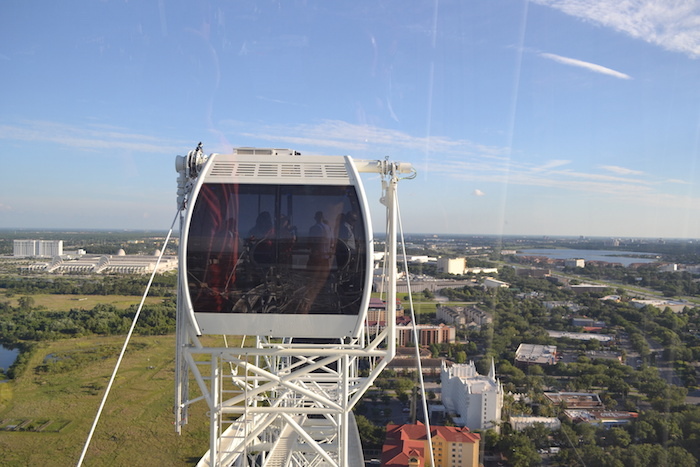 The Orlando Eye 400 foot high wheel opened its doors yesterday for the first time. Anticipation has been building for locals and visitors alike since the beginning of last year. 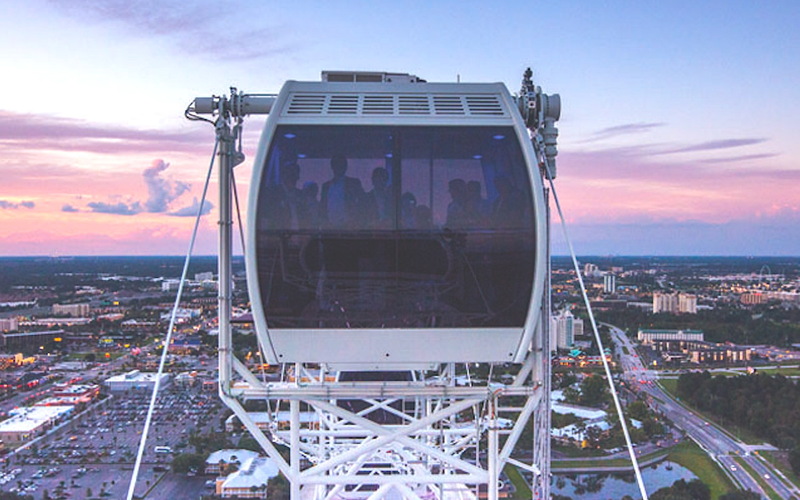 The Orlando Eye Ferris Wheel is an iconic 400 foot observation wheel that enables the visitor to see Orlando and its surrounding area from high above. This attraction is fun for all ages. The capsules are fully enclosed, air conditioned and large enough to hold 15 people. 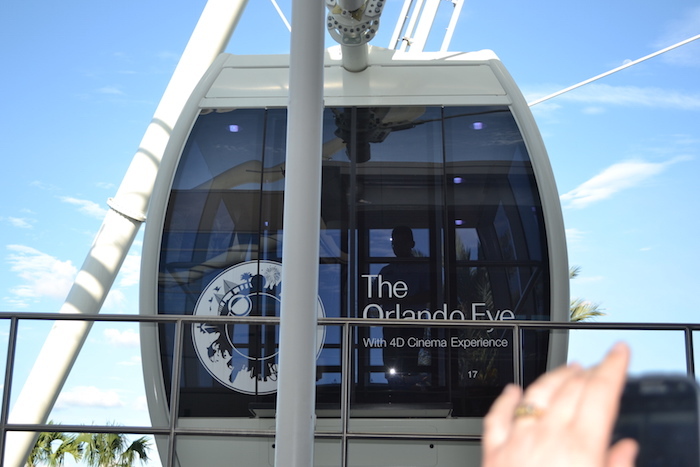 When I first saw heard about the Orlando Eye Complex, I was not very impressed. Just another glorified Ferris Wheel, was my first thought. As I watched it being built, I quickly realized this was definitely NOT your run of the mill Ferris Wheel. It was much bigger than I originally thought and so much better. As the construction came to an end, I couldn’t wait to get to ride. The day finally came and I was stoked! We entered through the “Terminal Building”, and were quickly directed on where to go. First Stop, get your photo taken. They take your (and everyone with you) picture on a green screen. At this point, you have no idea what the picture is going to look like. (More on that in a bit). Next, is the 4D movie. The movie is really good, as if you are flying over Central Florida and viewing everything it has to offer. The 4D effects were good, complete with being splashed by water and the smell of the orange groves. On a side note, I noticed the movie covered Universal Studios and SeaWorld, but no mention or sight of Disney. I am sure there is a reason, but I thought it was rather odd. You then walk out onto the Loading Deck of the Orlando Eye. This is the first time that you really see how BIG this wheel is. Looking straight up, it is MASSIVE! The anticipation builds as you watch the capsules being loaded with the people in front of you. The wheel continuously moves, so they load and unload the capsules very quickly. As I stepped inside of the capsule, I quickly realized how roomy and comfortable they are. There is tinted glass on all 4 sides with a small bench in the center. We were then greeted by our guide or our “Capsule Captain”, as I called her. She had an iPad in her hand and quickly told us that she was there to answer any questions and to point out the key land marks as we make our way around. I expected the ride to the top to be bumpy and shaky, but was very impressed about how smooth and quiet it was. If couldn’t see we were getting higher, I wouldn’t even had thought we were moving had I not been able to see it. 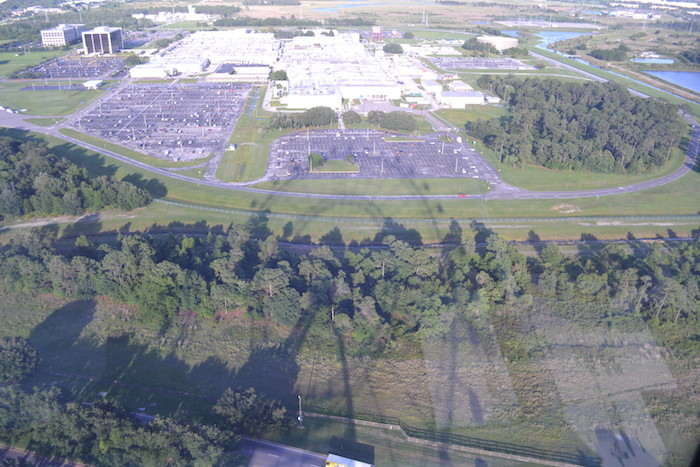 As we slowly raised above the tree levels, we began to see familiar ladmarks, such SeaWorld and Universal Studios, and some of the I-drive hotels and other locations. Of course the higher we went the more we could see. Off to the east, we were told we maybe be able to see the Vehicle Assembly Building at Kennedy Space Center. It was hazy that day, so we couldn’t see that. We could however, see the Downtown Orlando skyline. It was an awesome sight to say the least. As we approached the top our “Capsule Captain” pointed out various landmarks, and we could actually see the EPCOT ball off in the far distance. A quick shout out to Café Tu Tu Tango on International Drive, as they painted their name on their roof so everyone could see where they are. Give their marketing team a raise!! The ride ended and we were led back into the building. When entering the building we were guide over to view our pictures that were taken prior to the ride. They used the green screen to make it look like we were standing inside a capsule. It almost looked real. You could get two pictures, a souvenir book and digital copies for $35. Of course after that you walk through the gift shop. The have some very unique items all “Orlando Eye” themed. T-shirts, hats, notebooks…. Basically something for everyone. All in all, the Orlando Eye lived up to what it was supposed to be. I am sure that it will become an Orlando icon that locals and guests will enjoy for many, many years to come. Looking for other things to do local? Check out more on this website! The Orlando Eye is open everyday. Monday – Friday 10AM – 10PM. Saturday and Sunday 10AM – Midnight. Tickets can be purchased on their website, or you can purchase them at a discount from our preferred ticket vendor Kissimmee Guest Services. Love the new website and really enjoyed this article. I live in Ocala and have been reading about the EYE for some time now. I watched in awe as the London EYE was built and while I cannot see that anytime soon. The Orlando Eye will have my family as riders this Saturday. Thank you for an informative and interesting post. Thanks so much for the kind words Jillian. You will enjoy every minute of your flight this Saturday. Make sure you let us know what you thought after your flight. Enjoy!